Your Life Doesn't Have To Be Full Of Pain, Suffering, Vertigo, Fatigue and Brain Fog. Dr. Karl R.O.S. 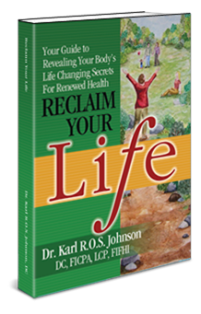 Johnson, DC Shows You How To Reclaim Your Life! Dissatisfied with the accepted medical practice of focusing on symptoms to attempt making people “well,” author and Doctor of Chiropractic, Karl R.O.S. Johnson, has a unique approach to healing the whole body and getting to the root of illness and disease. Dr. Johnson expanded his knowledge, diving into Functional Neurology, and expanding into all the fields of Functional Medicine. Today he shares this passion in his new book; Reclaim Your Life: Your Guide to Revealing Your Body’s Life-Changing Secrets for Renewed Health available at Amazon. Author and Doctor of Chiropractic Karl R.O.S. Johnson does not simply prescribe a diagnostic tool or a particular treatment regimen. Rather, he takes time to explain, in completely understandable scientific detail, the practice of treating the whole person. He explores some of the tools that can be used in this pursuit, and then takes the time to examine the “why” behind each diagnostic and therapeutic tool. Thorough, detailed accounts from patients with Fibromyalgia, Balance Disorders, Migraines and Headaches, Thyroid Disorders, and Peripheral Neuropathy bring the information into focus. He then explores the symptoms, previous treatment attempts and results that patients have experienced with the “whole person” approach. Far from promoting obscure, ineffective methods, Dr. Johnson espouses using cutting edge diagnostic and treatment tools including extensive lab work to understand exactly what’s going on with a person. He then promotes the deceptively simple idea of treating the cause instead of just fighting the symptoms.